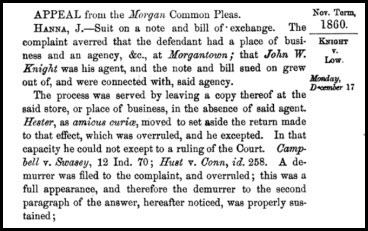 In November of 1860, the Indiana Supreme Court was called on to review a case from the Morgan County Court of Common Pleas. In other words, it was something the agent did or didn’t do that got him sued. First, the defendant answered by saying he wasn’t indebted to the plaintiff. But, second, the defendant said the way the complaint was served didn’t comport with the legal rules. And it was the lawyer for the defendant — one J. S. Hester — who raised that last point. The trial court agreed with the plaintiff, and judgment was entered against the defendant. And that’s when the case got really weird. Because the defendant appealed saying he really didn’t owe the money. But it was the lawyer — Hester — who said the appeals court should reverse the case because of the issue with serving the complaint. And, the opinion made clear, on that issue, the Court wasn’t buying it one bit. Because, it explained, on that issue, Hester was acting as amicus curiae. It’s a term that shows up time and again in court records that we look at as genealogists, so… here goes. A friend of the court. A by-stander (usually a counsellor) who interposes and volunteers information upon some matter of law in regard to which the judge is doubtful or mistaken, or upon a matter of which the court may take judicial cognizance. When a judge is doubtful or mistaken in matter of law, a by-stander may inform the court thereof as amicus curiae. Counsel in court frequently act in this capacity when they happen to be in possession of a case which the judge has not seen, or does not at the moment remember. In other words, it’s somebody who isn’t going to be personally affected by the outcome but who’s invited by the court — or invites himself — to provide information bearing on the decision. Call him (or her) a friendly intervenor. You’ll see an amicus many times in cases where the issue is one of broad public interest. A civil rights organization may ask to appear as an amicus in a case involving voting rights, for example. Or a business organization may ask to appear as an amicus in a case involving taxes on a business. The group has an interest in the way the case is decided, yes, but it’s not somebody who’s going to be personally affected by the outcome. And because it’s somebody who isn’t going to be personally affected by the outcome, the amicus isn’t allowed to do all the things that a party — somebody who is going to be personally affected by the outcome — can do. Most particularly, it’s somebody who isn’t allowed to appeal on the point if the court disagrees with him. Which is why the Indiana Supreme Court didn’t buy Hester’s argument. Because Hester wasn’t going to be personally affected by the outcome, and didn’t have the right to appeal the issue of whether or not his client had been properly served with the papers in the lawsuit. If that issue was going to be raised, it had to be raised by the client, not by the lawyer.